In an earlier post I owned up to the insane amount of jewelry I own. What's funny is that, for the most part, I wear the same basics most days. Diamond studs and my favorite sterling silver charm necklace by Lannae Johnson Designs. I have had so many complements on it. Classic and sweet, it is the perfect everyday staple. All of Lannae's jewelry is fabulous. The necklaces would be perfect as shower, birthday or Christmas gifts. Major mommy or grandma bling. Lannae is offering one reader a $50 gift certificate! 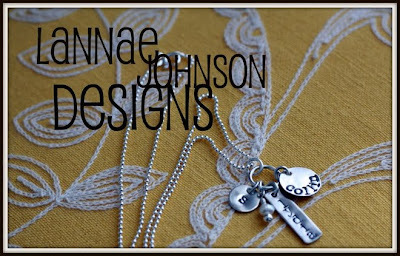 Go to Lannae Johnson Designs and look around at all the goodies. Come back here and leave a comment mentioning your favorite item. I will announce the randomly selected winner on September 9th. Good luck! Want to see what I want to win? Check it out here. Gosh! I love it all!!! I guess I would pick the circle of love and have my two boys names on it!!! Very beautiful stuff! I like the mother tag necklace - includes 2 tags and freshwater pearl dangle. I would choose the charmed, I'm sure, one or the monogram. Very cute! 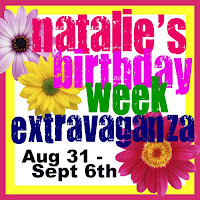 I have posted a link on my blog about your giveaway week. I love the mother tag necklace! I would love this for my sister who is moving far away! I have your sweet button! I love the A Full Heart necklace, how sweet! What a tough choice-everything is so beautiful! I think my favorite is the Simple and Elegant Necklace! I love the tag necklaces. I'm a follower of your blog...love it. Already have your button on my blog...see, told you I love it. Since I already have the ten tiny toes necklace (that I LOVE), I may would go with the sweet peas necklace. I love EVERYTHING!!!! I love the "A New Monogram..."
OH MY!!! Love all the designs....but, the "new monogram" or large "Blessed" are my favorites!! I love all of them! Such a hard choice. I guess I would have to choose either the love squared or the ten tiny toes/oval charm. choosing just ONE?!?! My goodness that was tough, I think Love squared or seeing stars are some of my favorites! and displaying that button proudly on the right! I grabbed your button and put it on my blog-- its super cute, by the way!!! Love the Charmed necklace like yours, I only have one child so mine would just be my husband's initial and my daughter's name.. It is so sweet, creative, and goes with anything!! I think I'd go with the charmed, I'm sure necklace! That one goes best with my style and I'm soon to be having my 3rd kiddo, so the names would look good on that one! check out my blog.. I posted about your great blog and its exciting giveways! i love the monogram on the diagonal square! My favorite (although so hard to pick) is the Mother tags. I love the Sterling Washer Necklace with White Coin Pearl! And I blogged about the giveaways! I love the charmed, I'm sure one. Lannae makes beautiful jewelry, like the "love squared" necklace. Not only is Lannae talented, she is a wonderful person with the kindest spirit. Anyone would be lucky to befriend her! i'll please take one sweet peas initial necklace. I love that "charmed necklace" like you have!! I love the variation of the charms!! My favorite is the simple sterling disk with the brown/bronze mother of pearl in the center. Love it!! My favorite is the simple and elegant. Perfect! I dont have children but this would make a great gift for my mom. I love the mother tag and the sweet pea necklaces (it looks like you have the combination of the two!) :)All of it is so cool, though! I love the ten tiny toes necklace! I love them all! I would have to pick the mother tag necklace. So classic. I like the circle/fresh water pearl earings. I think I like the sweet pea necklace, or the charmed, I'm sure. Beautiful stuff! I like the circle of love. Perfect for my best friend this holiday season! Adorable! Would have to have the charmed necklace. Love it! I love the sweet pea necklace- so cute. I like the Seeing Stars necklace. So fun! Love the mother tag necklace. These are great!! I love simple necklaces like this. I posted about your awesome giveaway! I love the mother tag necklace! Great stuff! I love the charmed one. Oh my, she has a ton of awesome stuff!!! I love the mother necklace, after five IVFs to get our two little ones, I'm a sucker for anything that represents them (and our girl isn't even due until next month)! My favorite is the love squared necklace, although I would love to get the ten tiny toes oval necklace for a friend who just had a beautiful baby girl! love the 'charmed' necklace!! Thanks for the wonderful giveaway. I love the monogrammed necklace! I love the Something Simple Earrings-so delicate and pretty! I am thorn between a full heart and Charmed, I'm sure! I am a follower of Natalie's Sentiments and LOVE it! I adore the Seeing Stars Pendant! My favorite is the Charmed I'm Sure necklace. They were all really sweet! I would love to get one for my Momma who's birthday is in October. I love the sterling silver washer necklace with the white coin pearl! I am of course a follower!! I love charmed and the circle of love necklace ... I can't choose! I got your button .. .of course! I like the Ten Tiny Toes and Seeing Stars necklaces best. I would have to pick the Mom tags charm necklace. They are ALL so cute, but it is the only one that will fit my 5 kids nicely :). I love it...I would love a charm to wear with my little ones name on it...and I love the simple hammered circle/pearl earrings...love it!! as a new mother, first son 7 weeks old, i have been looking for something to wear daily that will show my affection for my new little family of three (technically 5 including my two pups) and the "charmed, i'm sure!" necklace is perfect. to be honest, i have looked at a few similar necklaces but this one is perfect. simple but the pearl adds a great finishing touch. Oh my,.I love all the charm necklaces. I would love one with our family name,my husbands name all my 4 boys names on it...if it didn't get too heavy. I WOULD LOVE TO SEND THEM HOME TO sCOTLAND TOO FOR cHRISTMAS GIFTS TO FAMILY...nice and light to mail. I am a happy follower from Ooltewah. Ten tiny toes, it's a gift for a friend, so neat! I like the seeing stars one. So cute! She has some wonderful designs...Hard to choose one fave so I am choosing two...I love the sweet peas initial necklace and also the hammered circle with freshwater pearl earrings. Natalie... I am a FoLlOwER!!!! I love the circle of love necklace. My mom would think it was great if all three kids names could go on it. They are all so cute, but the Mother Tag would probably be on the top of my list! I'm now a follower... you've got me! Great giveaways, great blog! the sweet pea is my fav. gotta have my fleur-de-lis with it and it would be perfect. Okay, I love all the little charm necklaces. I didn't think I was the type to want to wear something like that but now that I think about it--I would love to get something with the li'l girl's and hubby's initials! I love the sweet peas initial necklace - so neat! I love the mother tag necklace and the full heart necklace. I LOVE the ten tiny toes/oval!